Pardon the public wanking, but I don't have anything else to write right now. Also, I forgot to get something finished for the Obscure Games Appreciation Day, but I still want to write up my suggested changes to Fantasy Wargaming. Over at The Mule Abides, James Nostack has written a screed claiming the end of the OSR (and this is not the first such claim I've heard – it's pretty much like "Death of Hippie" or "Punk Is Dead" it happens so often), now that a person using the moniker Skidoo has composed a complete flowchart of AD&D 1E combat, from surprise rolls to psionics and unarmed combat. Nostack's argument, as I understand it, is that because this ends any need for further analysis of the core engine that makes up AD&D, there is no further need for an OSR to exist. It seems as though his assumption is that such "rabbinical" (in his words) focus on understanding a particular form of the rules for D&D is the raison d'être of the OSR. I wrote in response to that, saying that for me, "the OSR is about a rejection of the primacy of story that ultimately led to the Forge and the concept of 'story games' or 'story now' play styles (and I was once very interested in Forge-style gaming – it was when I discovered that I wasn't having much fun playing that way that I looked around and found the OSR). It is about emphasizing actions over the alleged meanings of those actions. It includes a return to the wargaming roots of the hobby, and regains for logistics and strategic thinking a place in play that informs player choices rather than being abstracted away as supposedly 'un-fun'." That's really why I am interested in all of this early play-style discussion and practice. I look at it like this: back in the early days of motion pictures, they approached their subject like documenting a play or adapting fictional writing directly. It was when filmmakers began paying attention to the particular strengths of the actual medium, rather than adapting the methods of other media, that motion picture became a meaningful artform in itself. Similarly, if roleplaying games are limited to reproducing fictional writing or motion pictures in an interactive format, they will never get anywhere. It is only when roleplaying games take advantage of the unique strengths of the format that they will become a serious and meaningful addition to the arts. That's why I am not really interested any longer in rules that duplicate the requirements of traditional storytelling, such as "hero points" and the like (unless they are fully integrated into the setting, as was done with TORG, such that they become something that the characters could possibly discuss in a meaningful way). I realize that these sorts of rules showed up at an early stage (for instance, there is a crude "hero point" rule in Top Secret), but they seem unnecessary and intrusive from the perspective of roleplaying as a game. 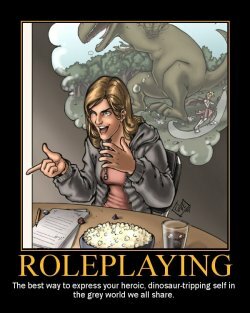 To me, roleplaying is about playing "let's pretend", not about making stories. That is, I want to be able to express my heroic, dinosaur-tripping self, not write a story about a guy who is heroic and trips dinosaurs, if you see what I mean. If I am not heroic, then my character in the game should not be. I can write a hero, I can write a story about tripping dinosaurs, those things are easy. What I want from a roleplaying game is to be able to be a hero, even if it is only at the table. To be a hero, I have to have the possibility of not being a hero in front of me. If I fail, then I fail, and failure can be fun, too, through pathos. Plus, there's always the next character, the next situation. I dunno, what do you think? Am I merely wanking here? Or is this line of thinking actually something that might inform real play at the table in a positive way? Or, more chillingly, is thinking about this sort of thing destructive to actual play, and my predilection for it part of the reason that I haven't actually played an actual game for months? "I look at it like this: back in the early days of motion pictures, they approached their subject like documenting a play or adapting fictional writing directly. It was when filmmakers began paying attention to the particular strengths of the actual medium, rather than adapting the methods of other media, that motion picture became a meaningful artform in itself. Similarly, if roleplaying games are limited to reproducing fictional writing or motion pictures in an interactive format, they will never get anywhere. It is only when roleplaying games take advantage of the unique strengths of the format that they will become a serious and meaningful addition to the arts." I think that's a really interesting analogy. For me, what makes roleplaying games great is how the experience of playing them is different from from the experience of reading a book, watching a movie, &c. Making rpgs more like books et al. really defeats the purpose for me. Heh! Yeah, I probably shouldn't pick on any particular mechanic. It isn't really as simple as "this is old school/this isn't old school" (or whatever we want to call the approach that plays to the particular strengths of roleplaying instead of other fiction forms). It's a whole - dare I even say "holistic"? - approach, where design is itself an art form. And that's another characteristic of roleplaying games that is interesting to me: the design is an art that exists to facilitate a performance, and the two are actually separate. This is why we can talk about "good design", and have that discussion be separate from "fun at the table". Any Referee can make "table fun" (or not), with any set of rules or none at all, so what, exactly, is "good design"? But that's another discussion. I tend to agree with you. I think that there are two different kind of games in this field. -The roleplaying games based on immersion: you are placed in the situation of your character, make your decisions and take the results. -The storytelling games based on identification with your character, where you help make a cooperative story. What makes the difference (what is the test for defining if a game is a roleplaying or storytelling game) is the point of view. In the first case, you have only access at informations or decisions available to your character. In the second case, you have access, through game mechanisms, to information or decisions outside of your character. So, you don't play through the eyes of your character, but above his shoulder. IMHO, there are lots of better ways to take part in storytelling than through RPGs (writing a book or working in Hollywood to mention just two), whilst there are no other ways than roleplaying to experience safely an alternates life. What muddles the discussion, is that those two kind of games share some mechanisms and also because some games can be a little bastardized. But they are two different hobbies, appealing to two different kinds of peoples. "IMHO, there are lots of better ways to take part in storytelling than through RPGs (writing a book or working in Hollywood to mention just two), whilst there are no other ways than roleplaying to experience safely an alternates life." That is exactly the core of what I'm driving at. I'm very glad to see that I am not alone in this. To me, that is the central point of the OSR, not close reading and analysis of particular rule sets. And that blog entry is definitely in line with my thinking on the matter. My own approach to OSR was that I was happy to pick up new stuff that was compatible with the old rules I preferred that had drawn on the strengths of what I liked with enough time, design "know-how", to avoid what I didn't like about older games. I also liked the greater DIY emphasis with the OSR with the end-result being great tools and resources for people to make their own (dungeon, dragon, rune, quest, star systems, frontiers, and gamma worlds). Light, to the point, and adventures that weren't built on leading players by the nose. Oh, definitely! The DIY aspects are critical to it all.